You know that Millennials have set themselves apart as having an alluring (maybe) but perplexing (certainly) distinction on almost every dynamic possible. You’d have to be under a rock in a cave on an island not to be aware of the deafening chatter on why – digitalisation, global economies, weather patterns (don’t put it past someone). In any event, it would be fair to assign a heavy influence to the speed of change – their effortless navigation at a pace in which devices, social media platforms, and even hashtags can become obsolete with startling abruptness. Perhaps they don’t even think of something as becoming obsolete, as that suggests some expectation of enduring utility and the loss as negative. They embrace the next thing as improvement, not replacement. But those are things. Stuff. What about values? Specifically, what about a value like diversity? Fair or not, the idea of speed and durability and transformation – these are all byproducts of a childhood that began in the waning days of dial-up. So if e-mail was your slowest communication medium, it makes sense to have a different contextual framework for how things change – virtual or three-dimensional. But why and how could values change? Especially a value like diversity, arguably still in its prime in the spectrum of widely held beliefs in modern society? It was less than a century ago that women won the right to vote in the United States, less than sixty years ago that racial segregation was outlawed, and even in comparatively liberal Western Europe, gay marriage wasn’t officially legal until the turn of this century (nod to the Netherlands). The valuation and promotion of groups traditionally marginalised, has fortunately become a fairly foregone conclusion across most socially progressive countries. Diversity — in terms of inclusion within professional, political and social circles — has meant everything from awareness and informed dialogue, to legal and aspirational tools designed to increase the presence of racial minorities, LGBTQ people and women (to name a few groups). That is how we define what makes a group diverse, and the goal of inclusion, as a fair and just treatment regardless of certain personal characteristics. Right? Right?! Enter stage left, The Millennials. It would surprise a fair number of even the only gently graying corporate crowd to discover that, yes, they see even diversity differently. In the first instance, it might be hard to imagine any other definition. But multiple studies (including this one from Deloitte) have identified that for Millennials — arguably in part because they grew up in a more global, connected, integrated system of schools, extracurricular group, and neighborhoods — it simply doesn’t resonate to value diversity on such “simplistic” traits. In fact, “cognitive diversity” (our quotes, not theirs) is a highly valued norm for them. Not about what you are, but how you think. And interestingly, it’s not about curing past wrongs but leveraging the uncapped value of different minds rowing in the same direction. To be a little rougher on Gen X and Baby Boomers – the value of diversity is not to be included in spite of what you are, but because of what you are. Compare the masculine shoulder-padded power suits of women in the 80s alongside the efforts of blacks, gays and foreign-born corporate achievers to sound “mainstream” with the unapologetic idea that what you are does in fact inform who you are, and all aspects of who you are contribute to your value. Millennials, in general, are more individualistic, less likely to conform to rules or conventions simply because of historical norms, and – to give a point to the older teams – less penalised by their peers for whatever “minority” characteristic they possess. In any event, it appears the bar is raising – celebrating diversity means it’s not simply “ok” to be…whatever you are…it’s important, valuable, and necessary to the success of the whole. None of this suggests that Millennials don’t value the legal and social inclusion that their grandparents (gulp) struggled to achieve. It’s simply that Diversity 1.0 is now obsolete. They are not long for nostalgia, which can be a bit heartbreaking for those reluctant to part with even their trusty wristwatch. But in this case, it is perhaps right that looking over your shoulder at a rougher, more utilitarian cure of wrong is better served instead by a mindset in which the differences are the asset, that they are necessary to ultimate success, that to lack diversity is to be impaired by a lack of full cognitive reach of solutions and innovation. 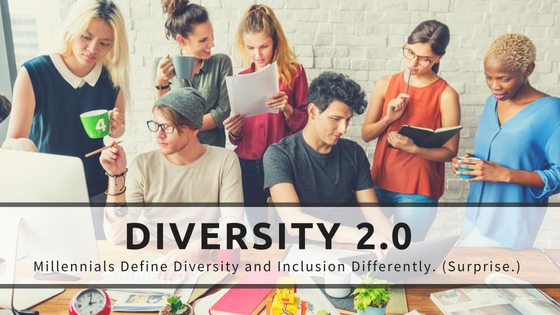 Diversity 2.0 is no different than the latest iPhone – retaining all of the relevant features of its predecessors, while being more powerful, less buggy, more ubiquitous, less heavy. And hopefully, with extended battery life. They should wake up and taste the coffee; grow up a bit before they make far reaching decisions to change the world, often adversely.